With age, changes in the eyelids (extra tissue and folds) convey an inappropriate message of sadness, lethargy or exhaustion. Beautif-Eye is a non-invasive alternative to plastic surgery. This eye cream demonstrates a lifting action on the sagging upper eyelid. Beautif-Eye lifts the upper eyelid and fights against the formation of crow’s feet, wrinkles and reduces the aged appearance of the eyes. An added benefit is that it evens out skin color to reduce the appearance of dark circles around the eyes. 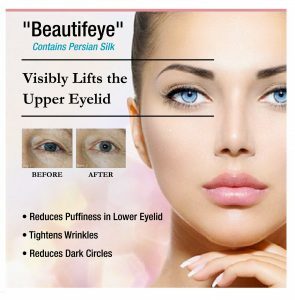 Beautif-Eye is a revolutionary eye skin treatment that uses plant extracts from the Persian Silk Tree and Asteraceae Siegesbeckia Orientalis to target the sagging upper eyelids.